Was Saturn Once Our Sun? With the onset of civilisation all the archetypes were already present: the mother & child, the sacrificial hero, the universal father and so on were present in all of the myths. This preoccupation by early cultures to ascribe universal events to terrestrial experiences appears to be a global phenomenon. If one were to examine the works of the classic Philosophers like Virgil, Ovid, Homer & Hesiod one would discover they all harken back to a golden age when different gods ruled the World, the shape and face of which were much stranger than the cosmic laws that govern us today. This can also be said of the architectural works of the Maya, the Ancient Khmer Peoples & others. All witness to an age of an unstable Solar System in ancient times. Egyptian High priests refered to this epoch as the age of the primordial Gods. A time when it was the planet Saturn that bathed our Earth in light, long before our present Sun existed. According to the works of controversial theorist Immanuel Velikovsky Venus appeared a terrifying comet in the heavens & Mars the pupil in God’s eye. In this age the planets in our Solar System followed different paths than they do today, in perfect alignment & in a Polar Configuration. The five planets orbited the Sun as a single linear unit, which rotated around a point close to Saturn, before its break-up at the end of the Golden Age. The violence of this revolution inspired the myth-making epoch of human history. Velikovsky claimed that Saturn was once closer to the Earth and dominated its sky, overseeing the Mythic Golden age that Plato & Homer reminisced about in their writings. Archaic symbols of this age still surround us, some as icons of the world’s great religions, and they are celebrated in festivals & cultural rites world-wide. The Egyptians associated this sun with Amon Ra, in Mesopatania this primordial sun was identified as a wheel & given the name Shamesh that translates as Saturn. The god Saturn was known by many other names by various cultures & civilisations throughout History, particularly the West. Saturn was an important Roman God primarily associated with Agriculture & Harvest. 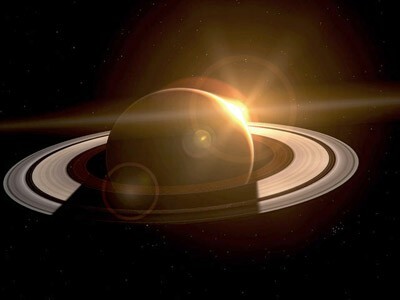 Saturn is the sixth planet from the Sun & the second largest planet in the Solar System. Saturn-day or Saturday is also the sixth day of the week according to the Gregorian calendar. 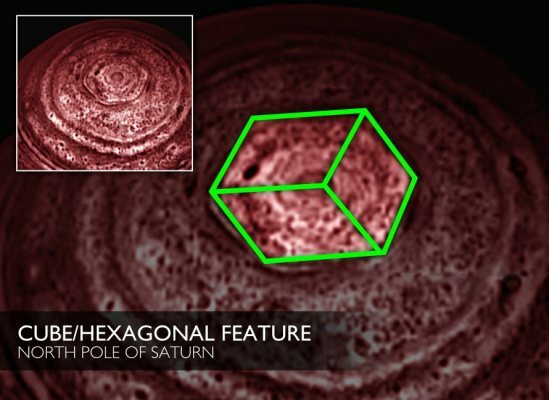 According to the latest satellite imagery Saturn interestingly enough has a six-sided-polygon at its North Pole. Further more we can draw a Hexagram Star motif from this Hexagon shape. A pentagram can be drawn inside the hexagram to form 2 inter-locking triangles. By applying simple Geometry we can also find combinations of the triple A six-sided star, a six-sided polygon, six smaller triangles, as well as a triad of 60° angles. In the southern Babylonian dialect Saturn is Stur. In this language where each letter of the alphabet has a corresponding number S is equal to 60, T equals 4 of00, U is a 6 & T 200, an equivalent of 666. According to ancient Sumerian texts the god of Harvest was called Ninurta, this translates in English as Saturn. 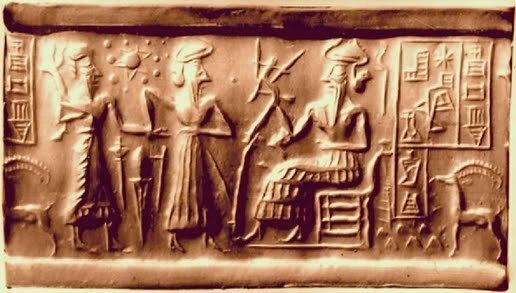 As depicted on one cylinder seal seated on the throne is Ninurta the god of Harvest brandishing a plough. in the upper left corner is a depiction of a solar system of planets. The signs of the Zodiac to the ancient myths are the petroglyphs of the primordial epoch projected onto the sky of a future time by the ancient philosophers during the Golden age, in an attempt to implant the information permanently on the conscious psyche of the world mind through the localisation of the imagery. Mount Olympus is the central focus of Greek Mythology, It is the seat of the Gods, or the central Pillar. The Gods being celestial, this can be interpreted as representing the Coaxial line from the earth to the heavens which formed the heirarchy of planets. At its summit was Saturn. 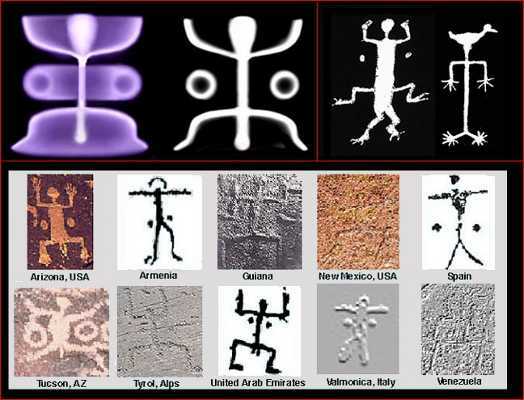 The Squatter Man petroglyphs for instance are a universal image depicted on the walls & artifacts of almost every culture on the planet. It is almost as though at a certain moment in prehistory the ancients were painting stylised individual rock art and then, almost instantaneously, they were painting strange white shapes and figures. Every one started at the same time dipicting the same images, almost as though they were inspired by the same event. This is only possible if what ever occured was a global event & was seen in the sky or the heavens. plasma Scientists postulate that these figures depict high energy electrical phenomona occuring in the sky. Anthony Peratt has matched the motifs of these rock paintings to electric discharges recorded in experiments in plasma physics. The presence of the god Saturn to ancient Peoples was known to the likes of the Greeks who knew him as Kronos, to the Sea-faring Phoenicians in the east he was El, Saturnus in Rome, Stur in Chaldea, and Ninurta in ancient Sumeria. His worship is at the heart of most pagan religions. The fiery heart & cross that are synonymous with the Christian Savior Jesus or the Emmanuel, also adorn the idols of the Maya, and may be found around the neck of Quetzalcoatl, whom they believed was a tall bearded white man. The sacred heart was also a symbol of sacrifice to the Aztecs, who were practicing this ritual by ripping out the beating hearts of their vanquished neighbors. Similarities can be observed in Christian symbols such as the dagger & chalice, tools used by pre-Columbian south American priests in their bloody rituals. The hexagon which is verily used by the Jewish faith is identical to that found in Hinduism. The six-sided star dates back 10,000 years & is referred to as Yantra & appears with the Gods Kali, Shiva. The Symbol also adorns the shrines dotting Nepal & on Tibetan Mandala; on Shinto shrines of Japan, & even the Islamic faith of Mohammad. The black stone at Mecca according to islamic tradition dates back to the time of Adam & Eve. Circumambulation is performed around the kaaba in Mecca in a counter-clockwise direction following the direction of the planet’s cloud system. Shamesh is SUN not Saturn. Yes! a Black Sun. Saturn is made up of the same elements as our sun, only it hasn’t ignited. I have spent the last couple of days on this guy’s site, re: Saturn worship/symbols, via the lens of Plasma cosmolgy and mythology. It’s worth a visit, if you have not done so, already. If you haven’t checked out “symbols of an alien sky” and the “discourses of an alien sky” & “thunderbolts of the gods” all which are free on you tube you really should it will open your eyes and answer many questions you’ve most likely always had your entire life. It certainly did for me. Aside from the name the saturnian death cult site was also very informative. The Electric Universe Theory is going to blow open and finally put to rest the ridiculous big bang theory with their invisible black holes dark matter and dark energy. It’s going to change cosmology and astronomy forever. Enjoy!